The 2019 Annual Conference will be held at the Embassy Suites by Hilton - Sacramento Riverfront Promenade on November 3rd and 4th, 2019. 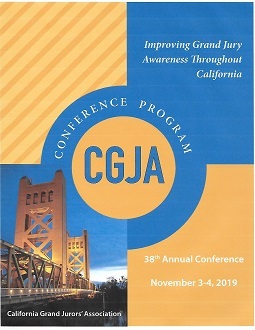 The theme for this years' conference is Improving Grand Jury Awareness Throughout California. Festivities will include a dinner on the evening of November 3. The conference schedule will be posted below when finalized in the summer 2019. You may register for the conference online here. To register by mail or email, click here. HOTEL RESERVATIONS: The Embassy Suites Sacramento-Riverfront Promenade is now accepting reservations for your attendance at the CGJA Annual Conference. Their street address is 100 Capitol Mall, Sacramento, California 95814. Call the hotel directly at 916-326-5000 and ask for the California Grand Jurors' Association Conference discount rate. Make your reservation online at sacramento.embassysuites.com and make a reservation using the group/convention code CGJ. The CGJA daily room rate is $149 for a standard two-room suite with two double beds. Note: There are a limited number of standard two-room king suites available for $149. Note also: There are a limited number of river-view two-room king suites available for $179. Reservations must be made by October 19, 2019. Reservations made after that date will be subject to the prevailing hotel rates and are subject to availability at the time of booking. Parking options: Valet service is available at the hotel at a discounted rate of $25/day. Self parking is also available at a city garage across the street for $20/day. The hotel offers limited shuttle service to the Sacramento Airport. Direct inquiries to the hotel. The AMTRAK Sacramento Valley Station (401 I Street) is located 5 blocks (0.7 mi) from the hotel. For a list of things to do in the Sacramento area, click here. For attractions in Old Town Sacramento near the hotel, click here or insert http://www.old.sacramento.com in your web browser. Please direct all queries or suggestions about the annual conference to Lloyd Bell, Annual Conference Chair. Transcripts of Conferences since 2006 can be found in the December issue of the Grand Jurors' Journal for that year which contains a summary of the conference of that year. Go to Journal Archives to find these editions. Transcripts of Conferences held prior to 2007 are archived here.